There are four species of anacondas: the green anaconda (eunectus murinus), yellow anaconda (eunectes notaeus), dark-spotted anaconda (eunectus deschauenseei) and Bolivian anaconda (eunectus anaconda). These large, slow-moving snakes are constrictors who crush their prey in powerful coils. Once the prey is dead, the snake swallows the creature whole. Anacondas are careful hunters who rely on surprise rather than speed to capture their food.The female anaconda eats seldom, probably due to the dangers involved with eating fierce animals. Anacondas are nocturnal hunters and tend to hunt in and near water. For this reason, they commonly prey on aquatic animals such as fish, if they can catch them, as well as frogs and turtles. They also go for smaller snakes, lizards, crocodiles, caimans and anything else that swims in the water. Despite their lumbering size, the anaconda can strike rapidly at the prey and capture it in backward-facing teeth from which the prey can't escape. 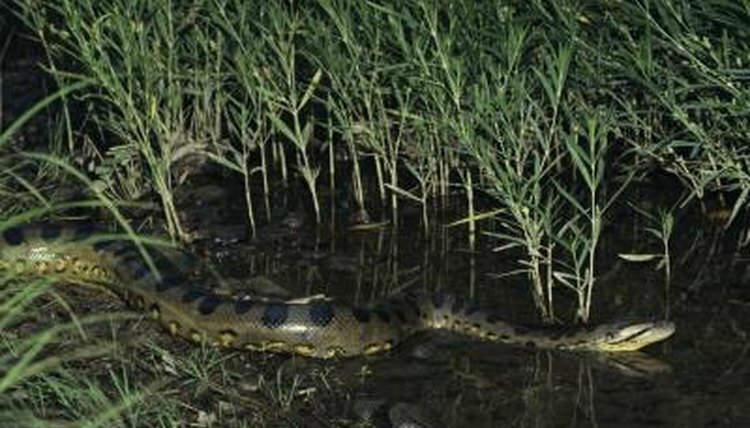 Animals that come to the water's edge to drink often become prey for the anaconda. Deer are common prey, as well as the occasional large cats like jaguars. Anteaters, primates, pigs and peccaries are part of the snake's diet as well as the pig-like tapirs, dogs and large rodents such as capybaras. Some of these animals fight back violently. Young anacondas (neonates) eat rats and mice, baby birds, frogs and whatever small fish they can easily catch. Anacondas have been known to eat each other in cases of large snakes encountering smaller ones. Why this happens is not known, except for the possibility that the large snake is hungry and the smaller one is convenient prey. Typically this occurs when a large female anaconda eats a smaller male after breeding. The female has a gestation period of six months and can carry up to 100 young at once. Her hunger rises during this time. When birds come to the water to drink or bathe, they can become a snack for the anaconda waiting stealthily in the water. The larger snakes will attack geese and other large fowl such as swans, while the neonates will eat the smaller birds and chicks. Anacondas have to be careful when eating large birds due to their sharp claws and beaks, but since bird bones are hollow they usually break easily, and the bird is quickly killed.